Nature’s Harvest® provided coupons & a gift card to purchase ingredients for this post. All opinions are my own. When you have a busy work-at-home-lifestyle, it’s easy to forget to eat. When I do remember, I’m usually eating in front of my computer, taking a “working lunch.” Usually it’s more work than lunch! Sandwiches are the easiest way for me to work and eat at the same time. I’ll be honest, my sandwiches are pretty boring because I’m such a picky eater. When Nature’s Harvest® bread challenged me to come up with an original recipe, I had to think outside my usual routine. My mom eats a lot of tomato sandwiches. I swear she practically lives on them! I wanted to come up with a way to make her regular old tomato sandwich a little more interesting. Since I know nothing about what goes well with tomatoes, I hit the internet and looked at about 50 tomato sandwich recipes for inspiration. I researched flavors and tried to figure out what went well together. I asked my mom what she would eat. 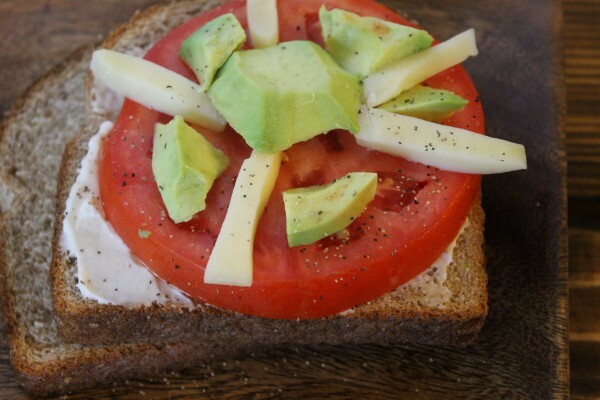 The end result is super easy to make, yet really classes up your plain old tomato on bread. Plus it’s all mine! My mom was my taste tester and she said I did good, so I hope you like it too! 1 thick slice of tomato (I used Hot House Tomato, and it makes a difference. Don’t get the cheap tomatoes, splurge and get something good. You can get a few sandwiches out of one tomato). 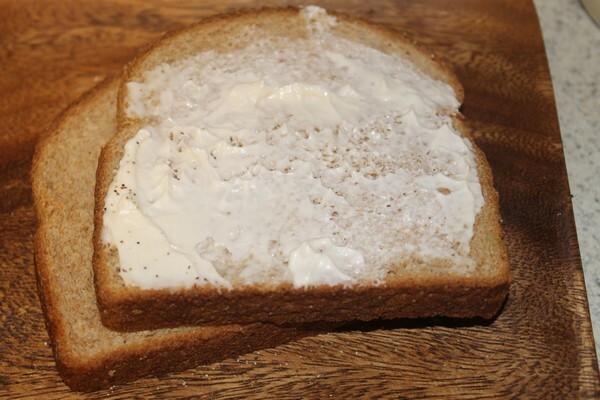 Spread a layer of mayo on the bottom piece of bread. Thick or thin, it’s up to you. 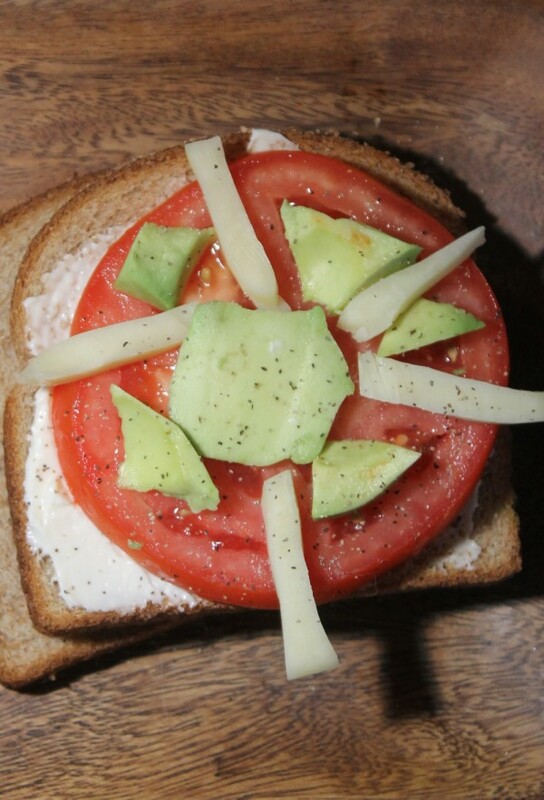 Fill in the gaps between the avocado with small slices of mozzarella cheese. Top with other slice of bread. You can add more mayo to that slice if you want, or not. That’s really up to you. Originally, I was going to add bigger slices of avocado and a thick slice of that super fancy mozzarella cheese, but turns out the stuff I bought wasn’t the “fancy” stuff AND I have no idea how people slice avocados so pretty. So this carousel sandwich actually became a thing because I messed up the original recipe. Did you know that, as an adult, you’re supposed to eat 48 grams of whole grains daily? Your kids (ages 4-13) should be getting between 40-48 grams daily. Yet, according to studies, many of us aren’t reaching that daily minimum. 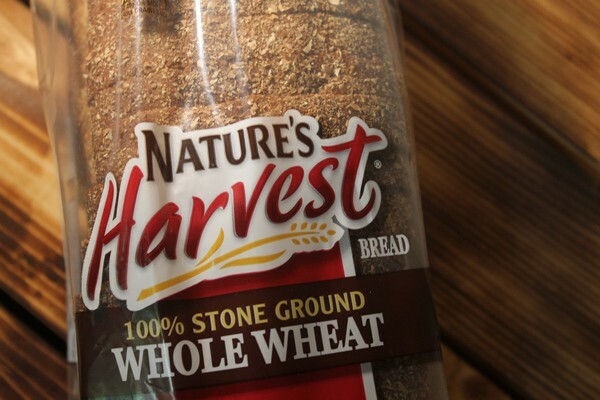 Nature’s Harvest bread is baked with at least 8 grams of whole grains per serving. 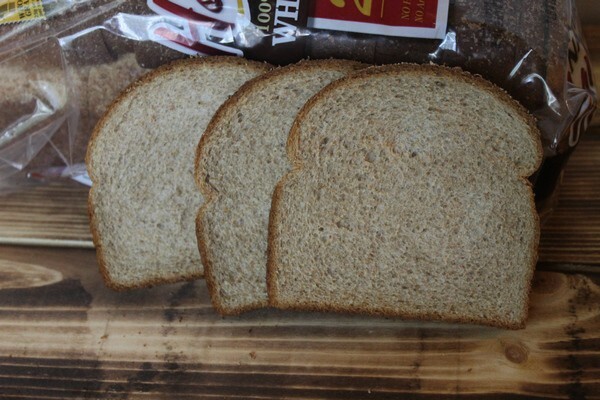 The 100& Stone Ground Whole Wheat Bread has an incredibly 25 grams per serving. One sandwich and you’re halfway to your daily recommended requirement. Nature’s Harvest breads are made without artificial flavors or colors. They’re also completely free of high fructose corn syrup. They come in many delicious varieties, from Honey Wheat to Butter Top, and even Buttermilk Made with Whole Grain Bread. I am definitely trying that one next! 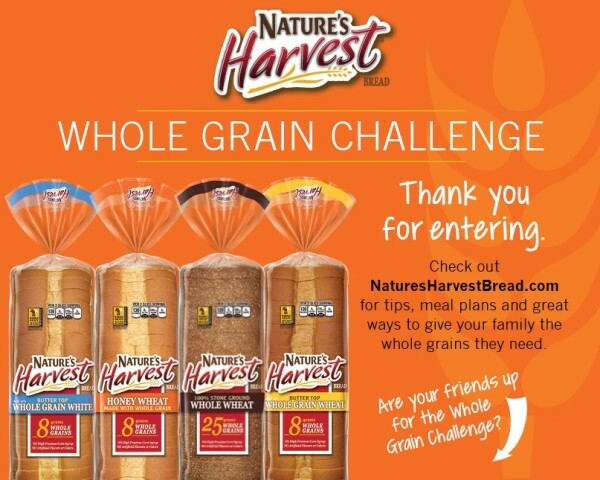 To help encourage you and your family to incorporate those 48 grams of whole grains into your diet, Nature’s Harvest® bread launched a fun “Whole Grain Challenge.” From now through August 10, take the whole grain pledge on the Nature’s Harvest® Facebook page and you’ll automatically be entered into a weekly sweepstakes. You’ll also find great educational resources on the Facebook page as well as Nature’s Harvest® website to help you stay on track with the challenge. 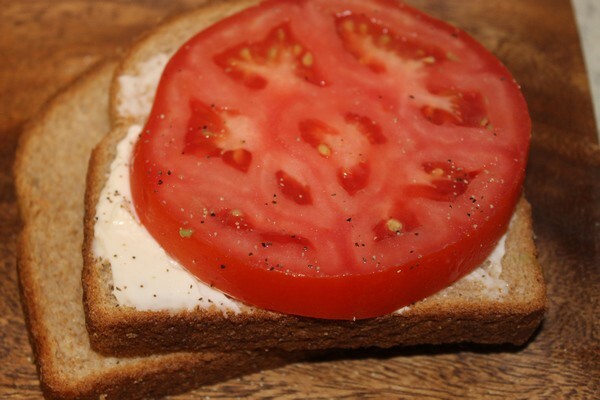 My favorite in summer is a sandwich of the freshest bread with good mayo, and slices of a garden tomato freshly picked and still warm from the sun. Tuna Salad Sandwich is my favorite! I like an egg salad sandwich. My favorite sandwich is a turkey sandwich with tomato, lettuce and mayo. My favorite cold sandwich enjoyed on fresh Natures Harvest bread is a BLT, and my favorite hot sandwich is a grilled cheese with tomato. I like tuna avocado sandwiches. I really like a brown sugar ham sandwich…and also salami at times. I prefer mayonnaise on these sandwiches and fresh tomato when I have it. My favorite sandwich is a turkey BLT on sourdough. My absolute favorite is a Monte Cristo, but I don’t have that very often. I also love turkey and cheese. I like a thick BLT on French bread and I want jalapenos on it also! My favorite type of sandwich is a BLT. My favorite is a BLT on toast. I love hummus and red pepper sandwiches with sprouts. I like a turkey sandwich. Roast beef with dill pickles. I love turkey, bacon, lettuce & tomato with mayo. I like sliced turkey, swiss cheese with fresh lettuce, tomato and deli mustard. I like a BLT when I can get fresh local tomatoes. My favorite sandwich is a BLT with fresh garden tomatoes. I like roast beef on rye with sliced raw, sweet onions. Tuna is probably my favorite. I seem to choose that most of the time at sandwich shops. I make it at home a good bit, too. My favorite sandwich is a BLT. I like turkey breast and muenster cheese with lettuce, tomato and avocado! Shaved Krakus polish ham, salami, provolone, tomatoes with olive oil and oregano and seasoned salt. Grilled pastrami and corned beef on rye w/ swiss. My favorite type of sandwich is a grilled cheese with Manchego and Pecorino Romano. YUM! I love a good corned beef special. My favorite type of sandwich is a ham and cheese sandwich! My favorite sandwich is peanut butter and banana on honey wheat bread. Thank you! My favorite sandwich is a smoked turkey, bacon, swiss cheese, tomato, purple onion and avocado with chipotle sauce. My favorite sandwich is just one with lots of veggies and sometimes avocado. I like avocado and tomato sandwiches. My favorite kind of sandwich is lots of veggies; lettuce, tomato, bell pepper,spinach,black olives, pickles, and banana peppers on whole wheat bread! Yummy!! I like ham and cheese sandwiches. I like ham and cheese with mustard. I like ham and cheese! A classic. I love grilled ham and cheese sandwiches! Turkey & Swiss on Rye.